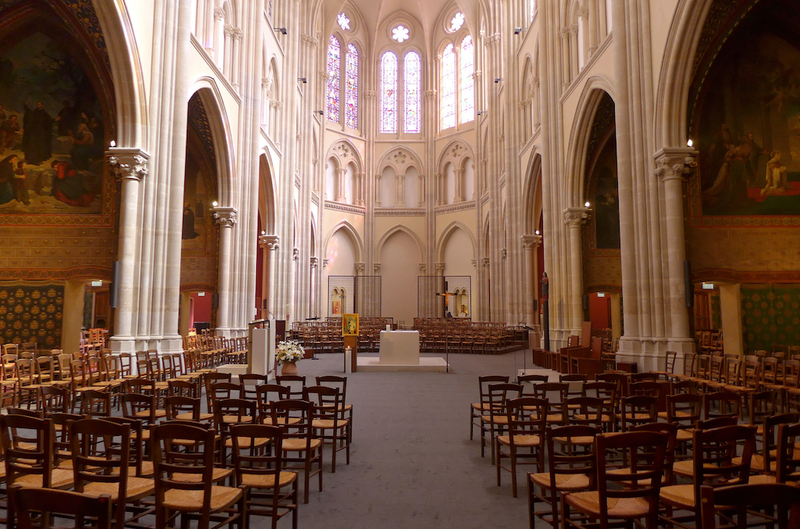 There are more than 100 churches in Paris. So many are beautiful or worth the visit due to their architecture or to the artworks that they house that I would not be able to choose a top three, a top five or even a top ten. 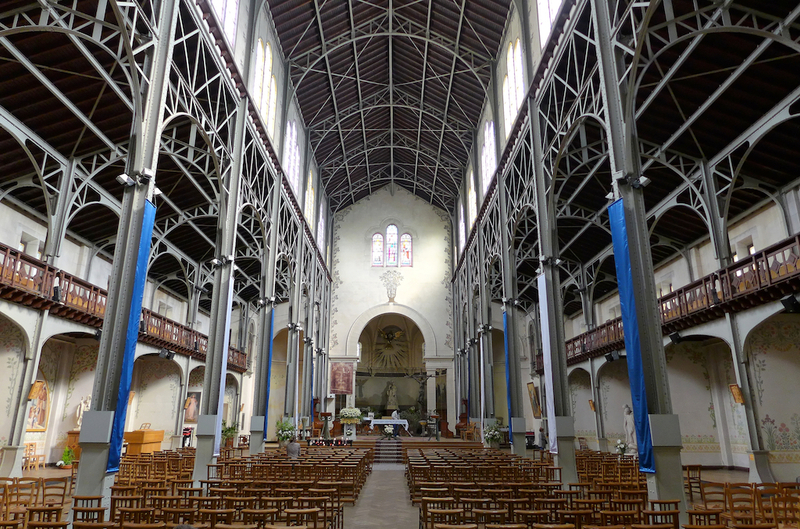 For that reason I have chosen to write a post about the most unusual churches in Paris. Two of them are really hidden and off the beaten track and one may have never heard of them. The other three are better known but each of them offers a unique and superb architecture not to be missed. Let’s discover them from the most secret to the most magnificent. One reaches the Eglise Saint Ignace through the porch of the 33 Rue de Sèvres: at the end of a modern corridor one can see two glass doors with the name of the church written on them. 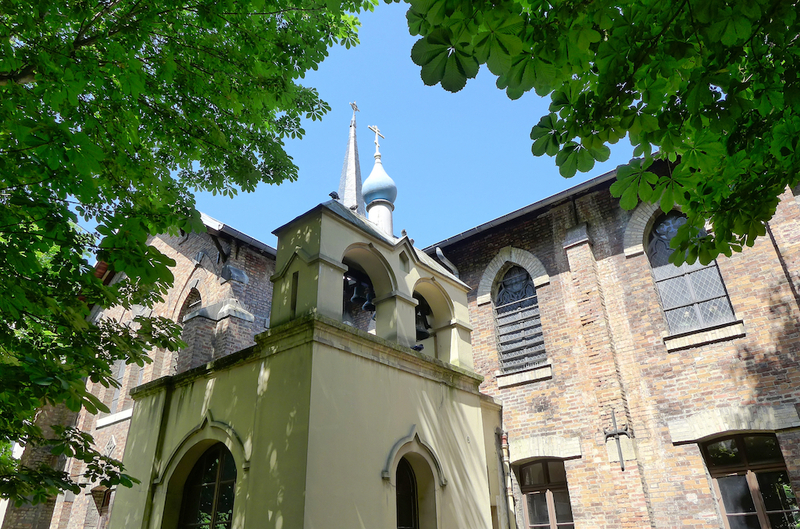 The Church cannot be seen from the street: since 1972 it has been completely integrated into the Centre Sèvres, the Jesuite Faculty of Paris. 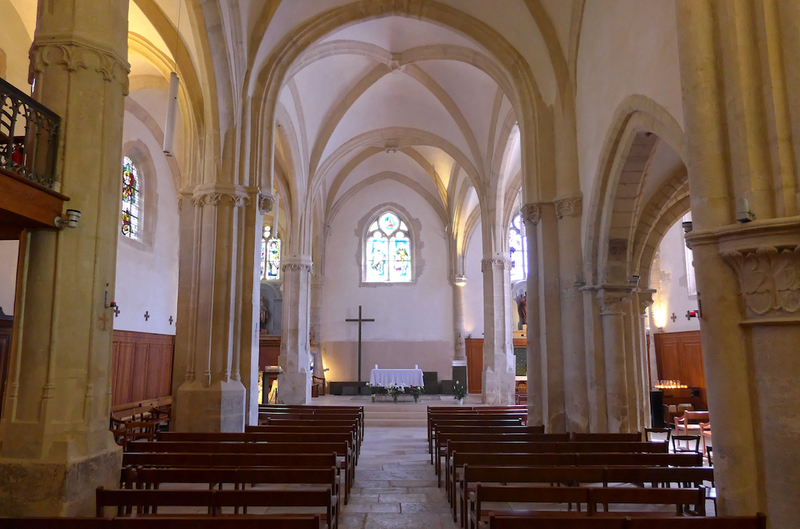 As its name suggests the Eglise Saint Ignace was built by the Jesuits 160 years ago. Here the altar is located in the middle of the congregation; the seats form an ellipse around it; and the congregation takes part in the celebration. 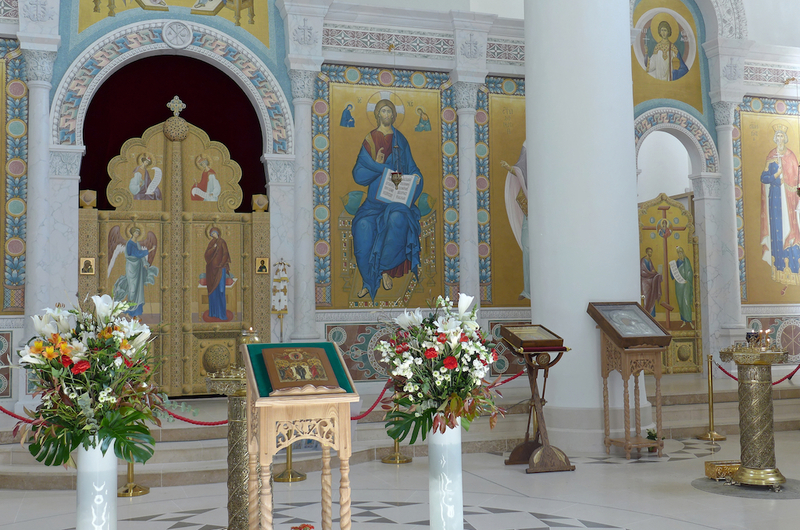 The Church has just been beautifully renovated and is now superb and bright. Yet the 52 windows of the triforium are blind… as behind them are standing the bookshelves of the Faculty’s library. The last step of the renovation will be the floodlighting of those 52 blind windows by painted glasses of light. Six of them are already in place under the organ and one can imagine what the atmosphere will be when it is over: peaceful and favourable to meditation. I love them… and for sure I will come back! The Eglise Saint Serge hides in the end of a path, in the middle of a garden and on top of the hill Saint Serge, an unknown hill in the vicinity of the Buttes Chaumont. Its history is fascinating and recounts the one of the migrations in this part of Paris between 1850 and 1925. In the second half of 19th century many German immigrants came and lived in that area. The hill was bought in 1858 by the minister Bodelschwing who organized a Lutheran congregation with a church, built in 1861, and a school. In 1918 the buildings were requisitioned by the French State and sold by auction a couple of years later. 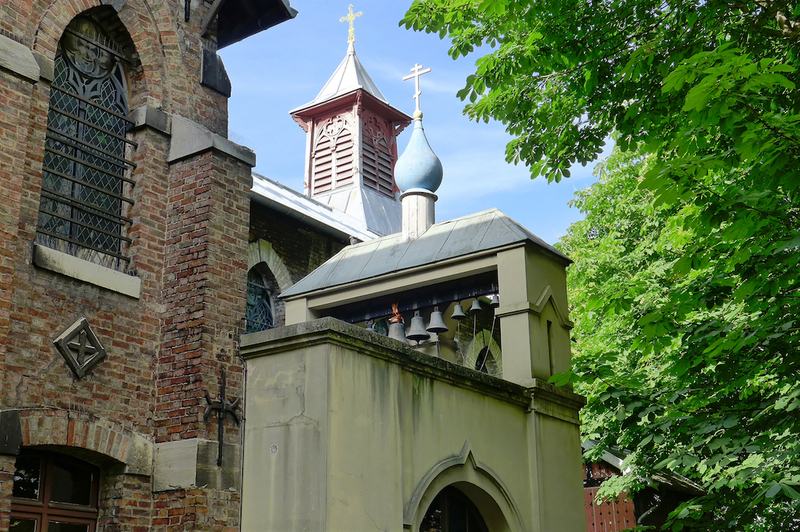 There were bought by the Russian Orthodox Church on 18 July 1924… on Saint Serge’s day. Indeed since the Russian Revolution many Russian people had emigrated to Paris and the building of a church for them had become necessary. The Lutheran church has been turned into an Orthodox one since that time. The outside of the church is charming and the inside is really worth seeing. One can enter every day at 7am for the matins and at 6pm for the vespers. And on 10 June 2018 a piano concert will take place in the Church. Not to be missed ! 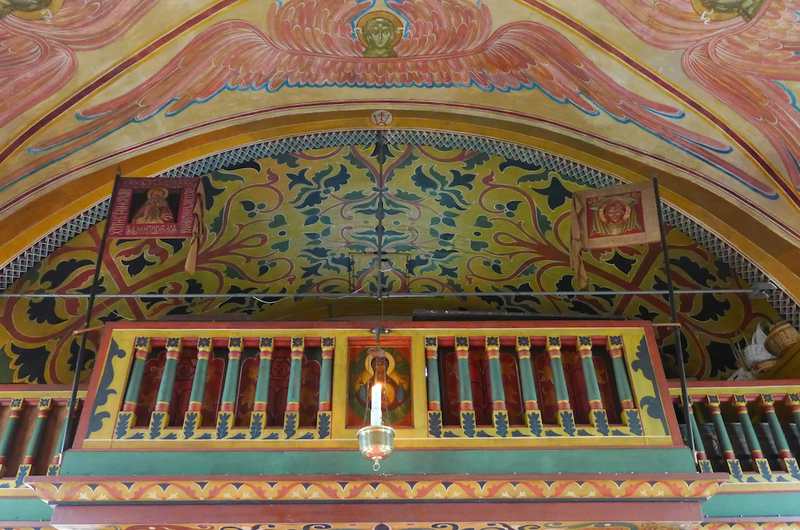 The walls, the ceiling, the benches, the stools, the candlesticks… everything has been carved and painted. One is captivated by the decor, the singing of the prayers mixed with the one of the birds, the leaves of the trees trembling behind the windows. One feels elsewhere, somewhere in the Russian countryside. 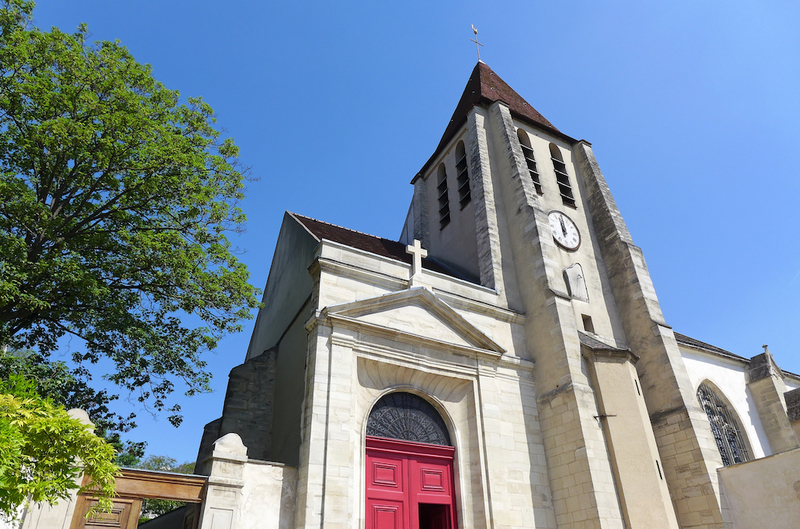 The Eglise Saint Germain de Charonne is perched on a promontory above the rue de Bagnolet and looks like the church of a village. One can still imagine it in the middle of vineyards as it used to be in the past. As rustic churches do, Saint Germain de Charonne still has its churchyard, which is almost unique in Paris: the only other Parisian church with a churchyard is Saint Pierre de Montmartre. The inside has been beautifully restored and shows the various ages of the history of the church with a mix of romanesque remains such as the big pillars of the tower; 15th and 16th century architecture; and more recent works such as the organ (1850) or the stained-glass windows (1950). I like its sobriety and rusticity. And do not miss a walk in the picturesque churchyard: so peaceful, unusual and charming, and offering nice views on the north side of the church. 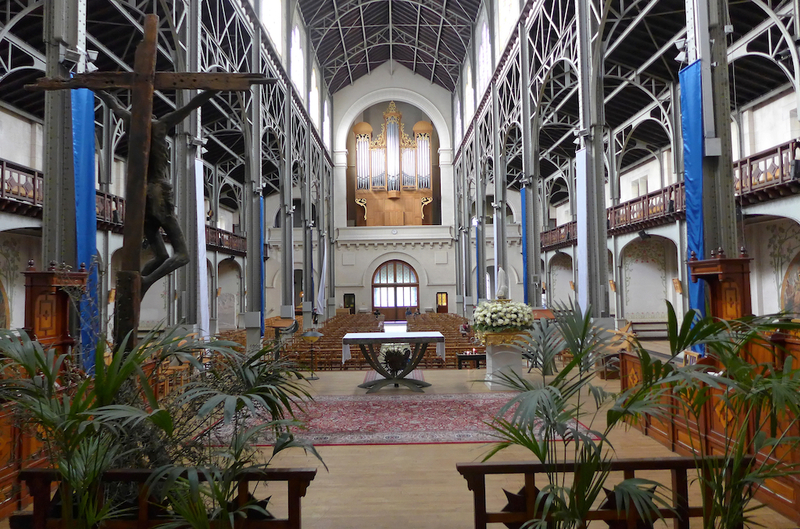 The Eglise Notre Dame du Travail was built between 1899 and 1901 in order to welcome the hundreds of people working at the World Fairs taking place in the neighbouring Champ de Mars. Indeed the former church, Notre Dame de Plaisance, had become too small. The contrast between the outside built in a traditional Romanesque style and the inside is striking. Both are beautiful but the interior design of the church is what makes it unique: The vaults are made of metallic arches carried by thin iron columns. The whole gives the building an exceptional brightness and lightness. I love it! Some of the artworks inside are also quite unsual and worth seeing. Three mural paintings in the side naves show patron saints for handicrafts: Saint Eloi (metal workers), Saint Luc (art workers) and Saint Joseph (carpenters). And do not miss the huge baptismal font or the chapel where a pieta and a war memorial coexist! 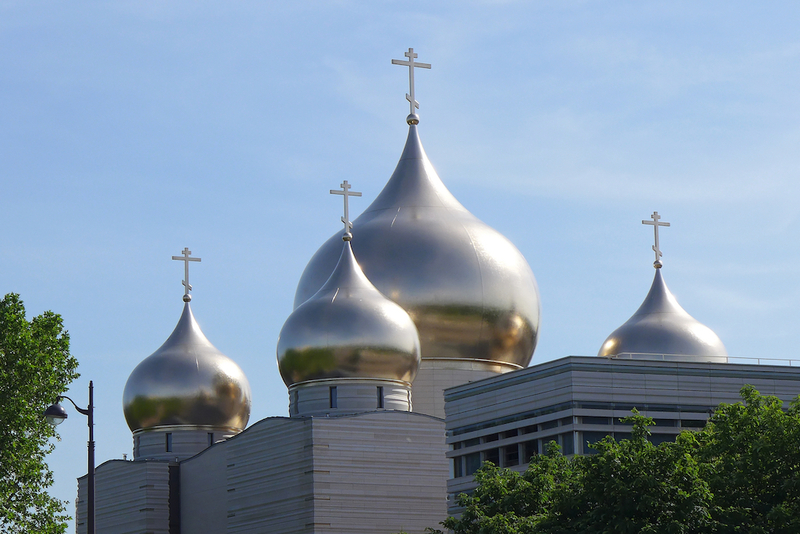 The Cathedrale de la Sainte Trinité is the most important Russian Orthodox Church in Paris. The project of its construction had been launched by Nicolas Sarkozy, Vladimir Poutine and the Orthodox Patriarch Alexis II in 2007 and knew ups and downs, just like the relations between France and Russia. 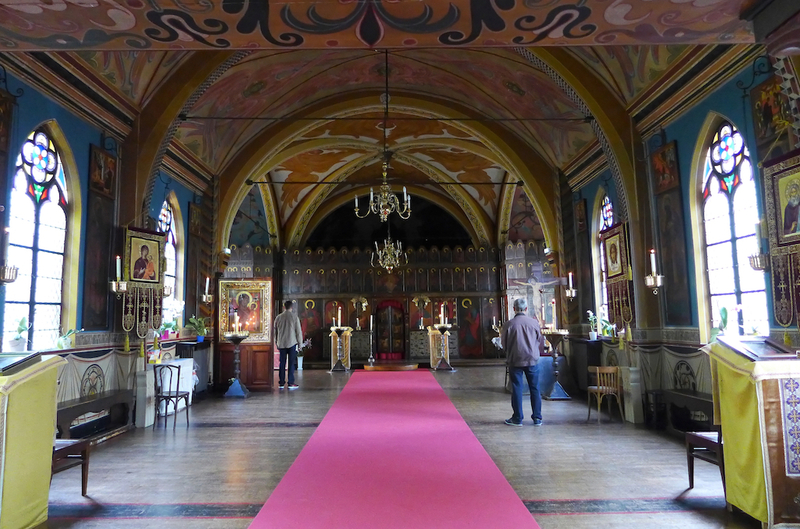 In the end the church was built, designed by the French architect Jean-Michel Wilmotte, and is part of the Spiritual and Cultural Russian Orthodox Centre. This Centre also includes on the same premises a cultural, an administrative and an educational building. The Cathedral was consecrated in December 2016. The outside as well as the inside are both huge, bright and modern. One can enter the Cathedral through a security gate and attend a free and very interesting guided tour. No chairs inside: Indeed in the Orthodox liturgy the congregation is standing during the one and a half hour celebration. 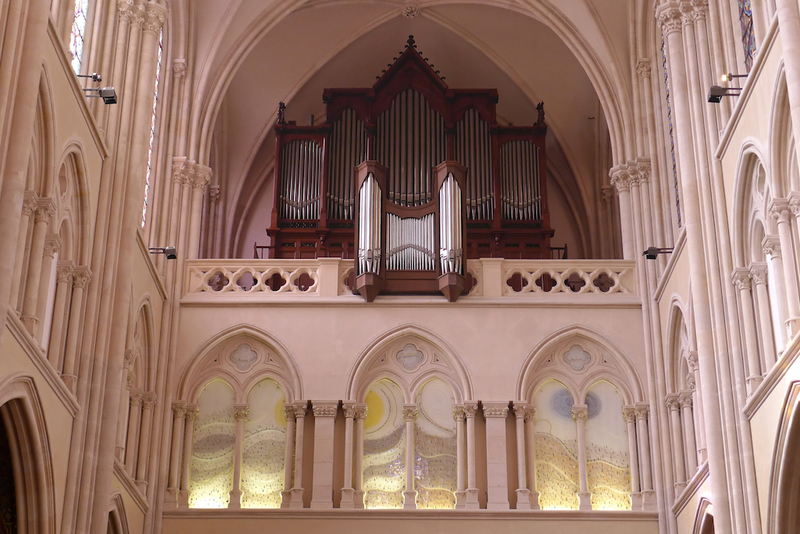 And no organ: the choir is standing on the balcony and the hymns are only choral, not instrumental. 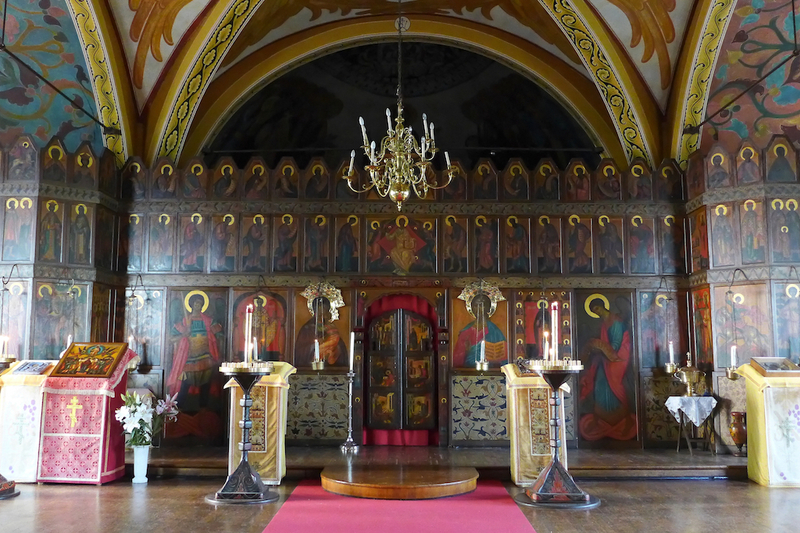 One will admire the magnificent iconostasis, the screen that separates the altar and the nave in the Eastern Orthodox Churches, which illuminates a besides white and sober inside.